Universal salt iodization programs, implemented in countries around the world for more than two decades, have led to remarkable progress towards achievement of optimal iodine intake and the prevention of iodine deficiency disorders (IDD). The absence of cretinism, decreasing goiter rates, and improving iodine status of the global population are all signs of this unique success. 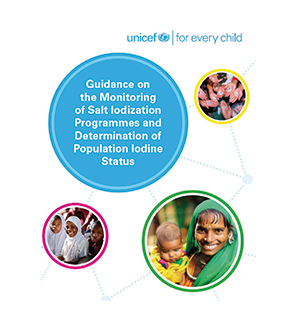 This publication is the outcome of a previous Technical Consultation on the Monitoring of Salt Iodization Programs, convened by IGN and UNICEF with the goal to reflect on IDD program experiences from the past decade and distill them into updated recommendations. The purpose of the document is to guide IDD program managers in avoiding common mistakes in data collection and interpretation, and toward better, more effective use of data in program implementation. The goal of IDD programs is to achieve and sustain optimal iodine status among all population groups. The impact of salt iodization is best assessed through the measurement of the population iodine status, as reflected by median urinary iodine concentrations (mUIC), while program performance is measured by the coverage of iodized salt at the household level. The document offers practical advice on how to most effectively use available monitoring tools to collect good-quality data that’s relevant to each country’s context and how to use the data meaningfully to improve the supply and reach of iodized salt. "The document offers practical advice on how to use available monitoring tools to collect good-quality data that’s relevant to each country’s context, and how to use the data meaningfully to improve the supply and reach of iodized salt." The context around iodine nutrition is changing. As an increasing number of countries achieve optimal iodine intake at the national level, it has become imperative to identify whether the achievement is universal and reaches all segments of the population. In order for this to happen, it is critical to first understand whether there are any sub-national differences in the supply of iodized salt (e.g., socio-economic and wealth factors, urban versus rural living). Furthermore, processed foods have become a major source of salt in our diets, and if iodized, this salt could be an important determinant of iodine status. The program guidance highlights how important it is to include the use of iodized salt in processed foods and condiments in national salt iodization programs. To effectively evaluate iodine nutrition programs, it is critical to have consistent and rigorous parameters to measure and interpret iodine data. This document addresses a number of those parameters, including: best practices for measuring iodine in salt, criteria for defining optimal iodine intake among school age-children, and how to interpret iodine nutrition data at the population level. It’s a major step toward supporting monitoring best practices at the national and global level. You can download the full guidelines from UNICEF’s website. A summary of its key recommendations can be found in a recent issue of the IDD Newsletter.